Gov. Janet Mills’ first budget address on Monday was as much about fleshing out her two-year, $8 billion spending plan as it was about reinforcing a wider course change from the era of former Gov. Paul LePage. AUGUSTA, Maine — Gov. Janet Mills’ first budget address on Monday was as much about fleshing out her two-year, $8 billion spending plan as it was about reinforcing a wider course change from the era of former Gov. Paul LePage. The new Democratic governor tried to thread a political needle with her budget proposal, which would hike spending by 11 percent over the baseline of the current budget while fulfilling promises to not raise taxes, fund voter-approved Medicaid expansion under the federal Affordable Care Act and boost school funding by $126 million. Republicans have called that unsustainable because it spends more than the state forecasts it will take in over the two-year cycle, balancing after transfers. Democrats have been quieter, but progressives criticized it for locking in tax cuts enshrined under LePage, a Republican. “This is a pragmatic, common-sense budget that lives within our means and delivers what Maine people want,” she said. Mills branded her proposal as a “hope” budget with a focus on “health, opportunity, prosperity and education.” She peppered her remarks with breaks from LePage on issues from Medicaid expansion to the state’s opioid crisis to a plan to reopen a state prison in Washington County. Federal funds also figure into her plan to address the state’s opioid crisis, which drove overdose deaths to 417 in 2017. That figure declined slightly in the first nine months of 2018, but Maine still experienced an overdose death a day during that period. She signed an executive order last week that set aside federal and state money for a package that includes buying 35,000 doses of an opioid overdose antidote that LePage once said “merely extends” lives. Her budget supplements those efforts with another $5.5 million. The budget, however, is full of half-measures. Mills’ K-12 increase leaves the state roughly $200 million short of a never-met, voter-mandated threshold of covering 55 percent of local education costs. 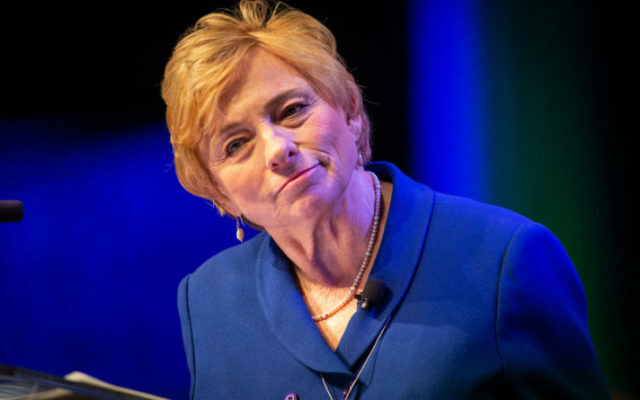 She wants to increase revenue sharing to cities and towns — while LePage once proposed zeroing in — from 2 percent to 3 percent, but that’s short of a 5 percent benchmark. “I question whether Maine taxpayers are really going to be held without any increases in taxes,” he said. BDN writer Alex Acquisto contributed to this report.